Beginning this school year, Pueblo High School administrators will honor students who have perfect attendance in an effort to encourage students to be present every day. Earlier this school year, in September, 252 Pueblo Warriors earned a certificate because of their perfect attendance. 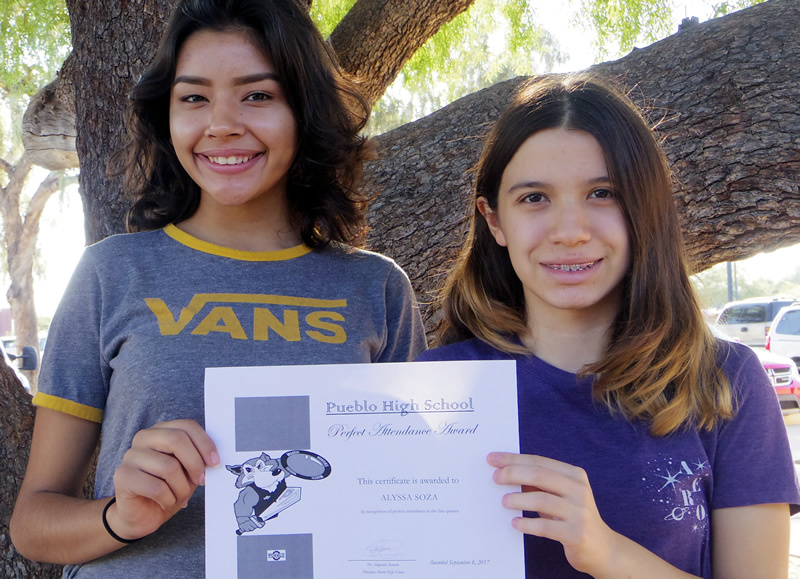 Freshmen led last month’s perfect attendance statistics, according to Assistant Principal Kathryn Gunnels, who created this program in order to stimulate better attendance. Gunnels said, “We want to reward [our students with] good behavior, and perfect attendance is a great start.” She added that they will be awarding students who achieve perfect attendance with certificates each month throughout this school year—and surprising some students with prizes. 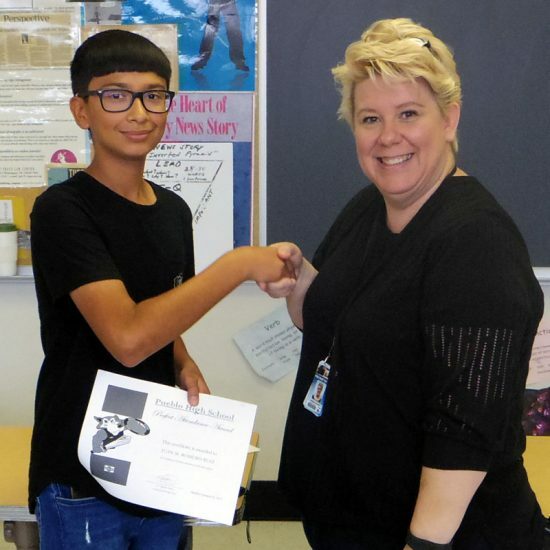 One of those “surprised” students, freshman Juan Romero Ruiz, was very honored by Gunnels. Freshman Alyssa Soza echoed Prado. Gunnels said she hopes seniors—the class with the worst attendance during the first quarter—take their last year of high school seriously, and to “kill” the “senioritis” bug now. Teachers, too, have been receiving “Perfect Attendance” certificates—a message from administrators that teachers are definitely appreciated, too, for their commitment to being here every day. In October, another 214 Warriors achieved perfect attendance; in November, however, the number of students with perfect attendance dropped drastically—to just 150. Gunnels said that she does not speculate why there was a dramatic drop from October to November. Learning Support Coordinator Ms. Sarah Barnes, a new employee to Pueblo this school year, distributed these certificates to teachers. Next Next post: Ready, Set… Cook!